We welcome spectators to cheer on their family and friends at the Start and Finish Line. Ample free parking will be available at the National Museum of the United States Air Force, where the race course begins and ends. No dogs, no bikes, no inline skates, no roller skates, and no wheeled vehicles (other than registered wheelchair and official Bike EMS and Patrol Teams) will be allowed. Strollers and baby joggers are allowed for the 5K event only. Join in the fun and excitement of race day. 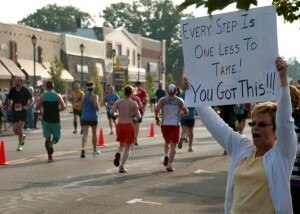 Watch the full marathon runners pass through beautiful downtown Fairborn, where many spectators line the streets. These maps cover the Fairborn section of the Full Marathon route, including public parking and street closures.